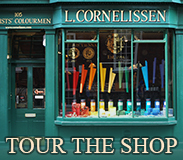 Exhibition in Cornelissen's window. From Wednesday 13th April to Friday 6th May. Please note the pictures below are not for sale. Prices indicate some similar materials to those used in these artworks. Click on each image for more details.